Strengthen and fortify fragile nails and prevent nail breakage with our reformulated ultimate renewing treatment. Infused with Horsetail Extract, Biotin, Vitamin B and Calcium to help repair damaged nails and protect against future damage. Extend the life of your manicure with this ultra-glossy topcoat reformulated with UV protection to prevent fading for stay true colour. This quick-drying, chip-resistant superstar leaves your nails with a high shine, smudge-free finish. Eliminate the need to clip and gently remove dry, overgrown cuticles in minutes. Regular use results in softer, healthier looking cuticles. Smooth and fill ridges with this perfecting primer while promoting stronger, healthier nails over time. Featuring Horsetail Extract and Hydrolyzed Silk, the fast-drying basecoat prevents staining and adheres lacquer to the nail for long lasting colour every time. Instantly quench dry cuticles with this intensive moisturizing and conditioning treatment. Enriched with powerful antioxidants to help prevent aging and drying and Phospholipids to maintain skin moisture levels. This no-mess cuticle massager delivers fast, non-greasy absorption. Accelerate lacquer drying-time and prevent smudges with our innovative dry oil serum. Rose Hip Seed Oil conditions cuticles for a healthy looking manicure. This nourishing treatment leaves your hands looking healthy and beautiful, leaving behind a delicate floral scent. The Waterless Manicure System – our philosophy for a healthy, flawless manicure. We believe the use of water and cuticle clipping compromises the integrity of a long lasting manicure. No water means less chipping. No clipping means less chance of infection. 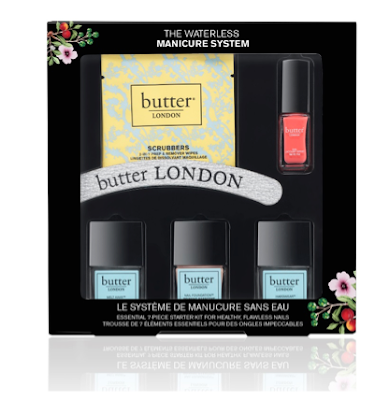 This kit features all the tools necessary to achieve a perfect manicure every time. • FASHION SIZE MELT AWAY CUTICLE EXFOLIATOR: Gently remove and soften cuticles. • FASHION SIZE HARDWEAR SHINE UV TOPCOAT: Stay true colour and ultra-glossy shine topcoat. • SIGNATURE BUTTER LONDON NAIL FILE & BUFFER: The perfect tool to shape and gently buff your nails. This is just a general PR info post. No review.